Do you think lifting kayak is an easy task? Most of the injuries are held during getting the kayak from the A position to the B. 1 Is learning Kayak Lifting necessary? 2 Step by Step Process of Kayak Lifting: How to do it? Is learning Kayak Lifting necessary? If you are asking the same question, possibilities are you have never get hurt or injured while lifting your kayak. If compared with the boats, we can say that kayaks are really lightweight. But you cannot forget that there are also kayaks that are really so much weight. You need to lift the kayak on your shoulder and that is possibly not an easy challenge at all. Not only the weight of a kayak but you also have to bear the length of the kayak in mind. Carrying your kayak will require you to be extremely careful because, with the long length of the kayak, you can hurt or injure any person in your surrounding. When you will know the accurate way of lifting the vessel, you will find this enough easier and bear your kayak will get a smoother task than it was before. 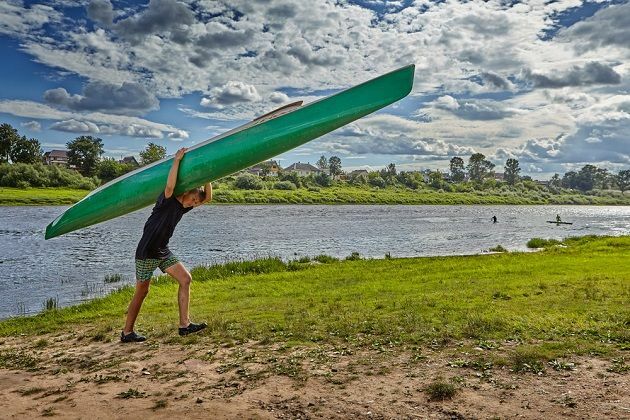 Step by Step Process of Kayak Lifting: How to do it? Keep your kayak in the ground and you have to stand to face the kayak. Keep the bow toward the travel direction (the direction which you want to travel.) The carrying trick is if the bow is facing to your right hand then you have to bear the kayak on your left shoulder. If the kayak’s bow is facing directed toward your left hand then you have to pick the kayak on the right shoulder. Now, ensure that the cockpit of the kayak is away from your body (facing away) and then roll it onto its side. You have to set your two hands over the rim of the kayak’s cockpit which is closer to you. Now you have to lift it up onto the legs. Here, your thighs are going to bear the weight of the kayak. During this, try to keep the knees bent so that any injury can be prevented. This will also lead the kayak to fit and sit securely and perfectly on the thighs. Now you are in your final stage. In this situation, all you have to do is keep your back straight and the knees should always be kept bent. Keep doing this till you reach the other portion of the cockpit. Try to keep the hands as close to the stern as you can. Now with the palm positioned upwards, grab the rim of the kayak. Now that you are done, you have to roll your kayak onto the shoulders. Use the hands for pulling it so that you can position it in a comfortable posture. You are done. Now stabilize it. Keep in mind the length of the kayak. Be aware of any kind of blind spots! Can you make the lifting of the kayak easier? Yes, you can. How? Here go some tips and tricks to make your kayak lifting system work easier than ever. You can settle on for a lightweight kayak. In this situation, the sturdy inflatable kayak can also do its best as it is lightweight for you to bear. 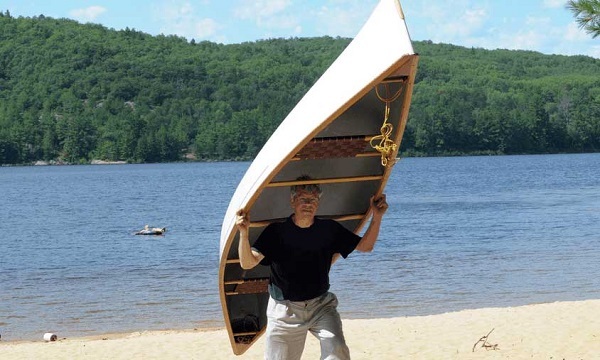 There are also some other ways which will require fewer aspects to carry or lift the kayak. If you are going for any plastic kayak then you can drag it because plastics can easily be dragged. Plastic kayaks can be dragged effortlessly in the sand or the grass but if you are in some specific terrains where dragging kayak will not suit then you will face difficulties. Fiberglass kayaks or composite kayaks are not drag-able because they will get damaged if you drag then. So, this option is not for these kinds of kayaks. When it comes to dragging a kayak, inflatable kayaks are also not drag-worthy. It will be better for you do not try to drag inflatable kayaks. What will you do it dragging is not an option for carrying your kayak? How will you bear your kayak if the distance between place A to place B is so long? The answer is Kayak Carts. Kayak carts will help you dragging your kayak from position A to position B if the distance is long. If dragging is not an option, kayak cart is. So select your kayak cart and carry your kayak wherever you want. PFD or Personal Floatation Device is a very important wear when you are fishing or kayaking. For making your kayak lifting system easy you can wear the Personal Floatation Device. This device will afford you a cushion. This cushion will guard your shoulder and will lessen your pressure also. What is the most important thing to remember when lifting the kayak with a partner? Kayak is not always lifted solo, sometimes two people lift kayak. The imperative thing you have to keep in mind when you are lifting kayak with your partner is the shoulder level should be the same. Is there any kayaks lifting device available in the market? Yes, if you do not have a partner or you have a heavy kayak or anything, you can get a kayak lifting device and kits from the market for lifting your kayak easily. What is most important while lifting the kayak with a rack or device? When you are lifting your kayak with any kit or rack, you have to ensure that the lifting straps are of high-quality. In 1911 it was found that among 2228 hunters who had kayaks, 867 kayakers were able to roll their kayaks. When two people lift any kayak, one should be there grabbing the toggle at the kayak’s bow and the other should be at the stern grabbing the toggle. The whitewater kayaks can barely exceed the length of 8 feet and the play-boats will length 5 to 6 feet. You have to lift your kayak and also have to keep the length in mind. Now that you know how to lift a kayak properly, you are ready for going to a kayak fishing or tour. It is up to you than how many people are going to lift a kayak. No matter what is the number of people, the foremost thing to remember is the strategy of lifting a kayak. Get ready with your kayak and go for rides. Because now you know the scheme.